TripAdvisor just released its 2019 Travelers’ Choice awards — and millions of visitors voted for their favorite destinations around the world. Whether you’re looking for a sandy beach or a bustling city, there’s likely a destination fit for you. Here are the top 25 best places to travel around the world in 2019. #25: Tel Aviv, Israel, features a quarter called “the White City” because of the over 4,000 buildings within that feature Bauhaus architecture. It’s the largest collection of Bauhaus architecture in the world, and was designated a UNESCO World Heritage Site in 2003. From a bustling nightlife to cyclists and weekly Monday night meet-upsof the Tel Aviv Rollers, there’s truly something for everyone in Tel Aviv. Fantastic beaches, museums, markets, and food are just a few of the things you must check out in this underrated Mediterranean gem. #24: Sydney, Australia, is more than just the world-famous Sydney Opera House. Created by architect Jørn Utzon, the staggeringly unique Sydney Opera House became a UNESCO World Heritage site in 2007 — and is just one of two cultural sites to be named as such while the architect was still alive. There’s plenty to do outside in Sydney. From visiting Bondi Beach to crossing the Sydney Harbour Bridge or visiting the Blue Mountains and Jenolan Caves, just be sure to bring your favorite sunglasses and plenty of sunscreen. #23: Cusco, Peru, is the home of Machu Picchu and so much more. There’s certainly plenty of hiking to do in Cusco — and the views can’t be beat. Definitely allow yourself time to wander the cobblestone streets, perusing food and the most local of coffee shops in between your outdoor expeditions. Those interested in archaeological ruins will find plenty to admire in and around Cusco — and anyone who wants to see llamas and alpacas up close will also have plenty of opportunities, even in the middle of the city. #22: Hong Kong, China, features a one-of-a-kind skyline and nightlife. Fans of modern architecture might want to visit I.M. Pei’s famous Bank of China Tower— or Zaha Hadid’s Jockey Club Innovation Tower. There’s something for fans of architecture in many eras as well, which is part of what makes Hong Kong so unique. Of course, there’s also plenty of food and drink to delight all your senses at any time of the day or night. 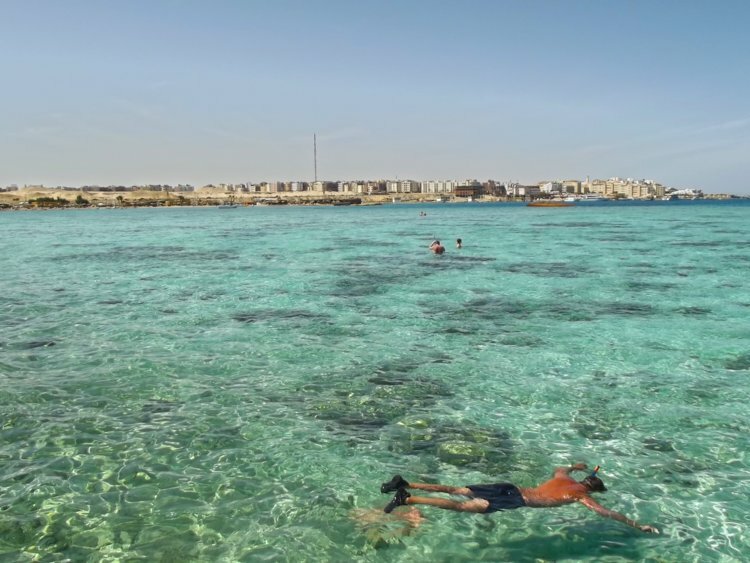 #21: Hurghada, Egypt, is a prime destination for diving and snorkeling fans around the world. Coral reefs and turquoise waters on Egypt’s Red Sea Coast can make almost all your photos look like perfect postcards if you visit. Windsurfing is also a popular pastime. If you fancy staying on land, there are plenty of desert safari tours on Jeeps or quad bikes to whet your appetite for exploration. #20: Jaipur, India, is home to some of the world’s most mesmerizing architecture — including the astounding Jantar Mantar. Built in the early 18th century, the Jantar Mantar is an astronomical observation site that became a UNESCO World Heritage Site in 2010. Of course, you must make time to visit the Hawa Mahal, also called the Palace of Breeze — which was built in 1799 out of red and pink sandstone. There’s also plenty of delicious food and shopping in and around the area, including in local bazaars. #19: Kathmandu, Nepal, is steeped in history. The capital of Nepal attracts backpackers and fans of outdoor activities from all over the world — whether by foot or by motorcycle, or even on safari in Chitwan — there’s a lot to do. From visiting the Boudhanath and Pashupatinath temples to doing a scenic flight tour around Mount Everest, there’s plenty to explore for whatever length of time you’ll be staying. #18: Lisbon, Portugal, is known as a center of art and culture — and also features the Monastery of the Hieronymites and Tower of Belém. Known collectively as the Complex of Belém, this UNESCO World Heritage Site was built in the 16th century to commemorate Vasco da Gama’s expedition. There’s plenty of beautiful and unique stone architecture to see on one of the city’s many walking tours — or you can lose yourself in seafaring lore at the Maritime Museum. Your trip won’t be complete without a visit to the Mosteiro dos Jeronimos— which was built over 500 years ago. #17: Playa del Carmen, Mexico, is a place you need to visit if you love diving. Vibrant sea life and the Rio Secreto underwater cave system are just two of the reasons you might rarely go indoors if you visit Playa del Carmen. If you love spider monkeys, you must visit the nearby Jungle Placespider monkey conservancy. If Mayan ruins are your thing, the Coba Mayan village is a must-visit. #16: Tokyo, Japan, can satisfy your appetite for both tradition and ultra-modernity at the same time. Food fans already know there’s plenty to keep you busy here — but even if you can’t take fresh fish home with you, a purely observational visit to the world-famous Tsukiji Fish Market is a must. From temples to karaoke bars to capsule hotels, about the only reason not to go is if you don’t like crowds — it’s a bustling city with plenty to do during every waking minute. Check out Tokyo Tower and visit the Meiji Shrine and the Imperial Palace to get a sense of history, and check out Odaiba to get a sense of how Japan envisions the future. #15: Hanoi, Vietnam, is full of beautiful sights and enticing food whether you travel on foot, by bike, or in vintage vehicles. From the Halong Bay Islands to the Hoa Lo prison, there areincomparable destinations and plenty of sights to see along the way. Check out the Temple of Literature, a Confucian temple built in 1070 to see a gorgeous example of traditional Vietnamese architecture. Hoan Kiem Lake, also known as the Lake of the Restored Sword, is home to both a rare breed of turtle and unbelievable views. #14: Jamaica is the place for lovers of warm tropical beaches, delicious food, and reggae and dancehall music. With its warm, tropical climate, chances are excellent you’ll be spending a lot of time outside — even if you don’t decide to go rafting down theMartha Brae river. There are plenty of beautiful beaches to choose from — but if you’d rather be under the water exploring, there’s plenty of snorkeling and scuba diving to keep you busy, including in the famous Blue Lagoon. For a truly unique experience, be sure to visit the Luminous Lagoon — microscopic organisms in the water make it appear to be glowing. Youcan even swim in the water and see the beautiful, natural glow firsthand if you like. #13: New York City, New York, USA, is a one-of-a-kind city — with unrivaled art, architecture, and culture of all kinds. From the Statue of Liberty to the Empire State Building to Broadway, there’s so much to see and do in this world-class city. Take a stroll through the world-famous Central Park, or experience great exhibits at the Metropolitan Museum of Art or the Frank Lloyd Wright-designed Guggenheim Museum. Also, don’t forget to check out the High Line— especially if you love to walk or jog around outdoors in a bustling city. #12: Siem Reap, Cambodia, is home to both Angkor Wat and Angkor Thom — and also the Angkor Night Market. Angkor Wat is the reason everyone goes to Siem Reap — but the 12th century Angkor Thom village is also a beautiful place to explore. There are plenty of temples to see, including Ta Prohm, Beng Mealea, and Banteay Srei. Great ways to get around including by foot, renting a bicycle, or by tuk-tuk. #11: Prague, Czech Republic, features some of the most iconic buildings in the world, including Prague Castle and St. Vitus Cathedral. Prague Castle — also known as Prazsky hrad — dates back to the 9th century, and is a UNESCO World Heritage Site. It’s considered one of the most important Czech cultural monuments. Be aware that even though it’s considered the largest coherent castle complex in the world, drones are not allowed on the premises— you’ll have to take photos and videos in designated areas in person. You can also visit the Charles Bridge, which was commissioned by Holy Roman Emperor and Czech king Charles IV in the 14th century. #10: Dubai, United Arab Emirates, is a city unlike anywhere else on the planet. With a uniquely diverse population, Dubai features stunning architecture, the man-made palm-shaped island that is Palm Jumeirah, and the Burj Khalifa— currently the tallest building in the world. If you love shopping, there’s a souk for all of your shopping needs— especially gold and spices. If you thought there couldn’t be a beautiful garden in the middle of a desert, you’ll need to visit the Dubai Miracle Garden to see it for yourself. #9: Marrakech, Morocco, is full of historic mosques, gardens, palaces, and markets to dazzle your senses. Known by some as the Red City due to all the red sandstone used in its unique architecture, the city is comprised of two parts: the Old Medina and the more modern area, the Ville Nouvelle. Be sure to visit the Bahia Palace, and take a little time to explore the gorgeous Islamic architecture inside Le Jardin Secret. You’re also just a day-trip away from the Ouzoud Waterfalls if you need a quiet break from the hustle and bustle of the city. #8: Istanbul, Turkey, is full of breathtaking architecture, bazaars, and traditional Turkish baths. Hagia Sophia has lived many lives— first as a church, then as a mosque, and now as a museum. From Basilica Cistern to Sultanahmet Square, there’s plenty of glorious architectural wonder to experience in Istanbul. You must also check out at least one of the city’s legendary bazaars. #7: Barcelona, Spain, is another must-visit for fans of architectural history — you can’t leave without checking out Gaudí’s Basílica i Temple Expiatori de la Sagrada Família. Although it has amazingly been under construction for over 136 years, the site was designated a UNESCO World Heritage Site in 2005. According to Artsy, it is scheduled for completion in 2026 — but is well worth visiting even before that time. There’s plenty of other Gaudí architecture to enjoy — including Casa Batlló and Park Güell — but more outdoor-minded people might like to visit the mountains of Tibidabo or Montjuïc. You might also visit the Gran Teatre del Liceu — Barcelona’s opera house, which was built in 1847. #6: Phuket, Thailand, is beloved by beach lovers and divers alike around the world. There are plenty of night markets around as well — so don’t think your fun needs to end just because the sun has gone down. #5: Bali, Indonesia, is home to beautiful temples, beaches, an active volcano, and a monkey sanctuary — there’s something for everyone here. From Lempuyang Temple— also known as the Gate of Heaven — to the very active volcano Mount Agung, you’ll find yourself surrounded by wonders both natural and man-made when you visit Bali. If you want to spend more time in nature, you can visit the Sacred Monkey Forest Sanctuary. Or, for a truly unforgettable experience, go snorkeling or scuba diving with manta rays at Manta Point. #4: Crete, Greece, is full of history both mythological and archaeological. If you read about the minotaur in school, you’ll want to see the ruins where legend has it that the beast once roamed — and the ruins at thePalace of Knossos is the place. For a beautiful beach experience that is unique to Crete, check outElafonissi. Those with an interest in archaeology will want to check out the Heraklion Archaeological Museum, which contains artifacts spanning 5,500 years of the island’s history. #3: Rome, Italy, has so many things to see, eat, and do — from the Sistine Chapel to the Colosseum — and there’s plenty of delicious food to keep you delighted all day and night. Opened in A.D. 80, parts of the Colosseum still stand to delight tourists from around the world to this day. If you’ve only ever seen photos of the beautiful frescoes that adorn the Sistine Chapel, your visit to Rome is the perfect opportunity to witness the real thing in person. For a glimpse of a different side of Roman history, you could also take one of the many Roman catacombs tours on offer. #2: Paris, France, is home to some of the best food in the world — and also the Eiffel Tower, the Arc de Triomphe, the Notre Dame, and of course the Moulin Rouge. Whether you’re visiting the big landmarks, the Louvre, or the Musee d’Orsay, be sure to take time to visit the Seine and walk along its banks. Of course, there’s incomparable food and shopping to be had as well, if that’s your thing — and don’t forget to eat some of the best pastries on the planet. #1: London, England, features a heady mix of history and modernity, from Buckingham Palace to the Tate Modern. History fans will no doubt flock to the Tower of London, where you can also see the Crown Jewels. You could also take a day trip to Stonehenge, or visit Abbey Road or even the Sherlock Holmes Museum. For a taste of some of the best the city has to offer, be sure to check out one of London’s many food halls.